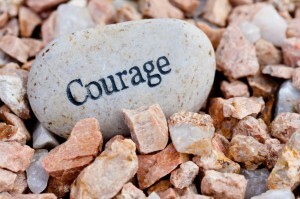 COURAGE written by Nancy Weshkoff | Moonflower Yoga Inc. In the last week at Moonflower Yoga, the subject of courage has been one of our focuses, and I wanted to expand a bit on this topic. Moonflower Yoga recently hosted a screening of the film LEAP OF FAITH, the story of BKS Iyengar’s amazing life. The film spans the 90+ years of his life plus his 7 decades of teaching. BKS Iyengar has led a remarkable life. He came from a humble background in India and was a very sickly child. His family was told that he would not survive into adulthood. Despite this dismal prognosis and through extraordinary circumstances, he found the will – and courage—to bring himself to health through yoga. Mr. Iyengar not only survived but flourished into becoming one of the fathers of modern yoga today. He is 93 years old and still practices yoga. Another event at Moonflower Yoga was a story telling session for children of JEEVA FINDS COURAGE. In this story, a little boy named Jeeva goes on a fascinating journey discovering new things along the way and uses courage to help him. The week has also been a busy one with some new students coming through the doors of Moonflower Yoga to try yoga for the first time. Many of these are baby boomers. It can take courage to try something new. I feel remarkably blessed to have these new students choose Moonflower Yoga as the place to start a new journey. Yoga has so many wonderful benefits, and I know they will join the other students at Moonflower Yoga who also walked into the studio doors for the first time a bit scared but now love practicing and return to the studio each week to feel better, learn something new, and have fun doing so. And, yes, it took courage to take that first step. How wonderful life can be when we find that courage and try something new. Do you have the courage to embark on a new path of discovery? If so, come try a yoga class or workshop at Moonflower Yoga in Bellmore, New York, in Long Island’s Nassau County. You will find great teachers who are dedicated to help you grow and learn. And your first yoga class at Moonflower Yoga is free so you have nothing to lose and everything to gain by having the courage to try yoga.